I've been a huge Brainstorm fan ever since the "Ambiguity" CD from 2000. I think that they peaked with the "Liquid Monster" CD from 2005, that album contains 11 killer tracks - Power metal heaven. The next two CD's also contained some killer tracks, but there are a couple of fillers on each CD. 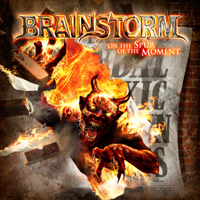 So can "On the Spur of the Moment" bring Brainstorm back to the champions league of power metal? Well after listening to the album a couple of times, I was thinking no. But after 12 - 13 spins I have to say that this CD kills. With singer Andy. B Franck Brainstorm has something that thousand of bands can only dream of, a singer that stands out from the crowd like UDO, Mustaine or Halford. Andy and his Brainstorm companions have delivered a fine album with some fantastic tunes like "No Saint - No Sinner", "Temple of Stone" or "In These Walls", all reminds me of "All Those Words" from "Liquid Monster". The limited edition comes with two extra tracks - Go and get it.